For the seemingly few who are in healthy, happy relationships Valentine’s Day can provide romantic inspiration. But for everyone else it can be an annoying reminder that they don’t have that kind of loving bliss. If you are finding yourself frustrated or lovelorn this Valentine’s Day I want to offer you some food for thought. 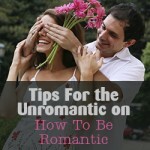 First, honestly answer this quiz question: If … [Read more...] about Un-Happy Valentine’s Day?